A study to determine if 'SmartBurn' will reduce smoke emissions in the town of Tasmania begins in June 2014. Undergraduate Olivia Johnston from the University of Tasmania will conduct a trial to see if the SmartBurn canisters will have an overall effect on air quality. Perth was selected due to its poor air quality and the presence of Environmental Protection Authority monitoring stations in the area. The success of this campaign will depend on the participation of all households with a wood heater. 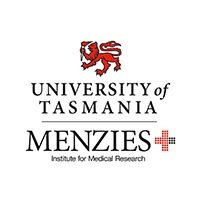 University of Tasmania and Menzies Research Institute "hope that everyone with any kind of wood heater will take advantage of this opportunity. It's free, it's safe and once installed you can forget about the device all together." The Smartburn canisters have been donated by SmartBurn Australia for this research project, however we have no active role in the study. 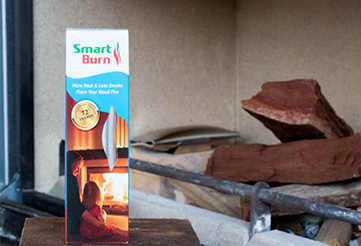 Under laboratory test conditions SmartBurn is proven to reduce emmissions bu up to 54%. We look forward to hearing of a successful outcome. 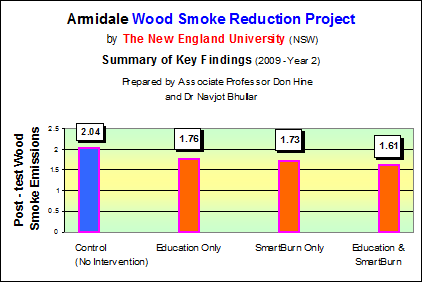 Researchers at UNE (University of New England, NSW, Australia) with support from Armidale Dumaresq Council, NSW and SmartBurn conducted a 3 year field experiment between 2008- 2010 assessing the effectiveness of education and SmartBurn in reducing air pollution generated by domestic wood heaters. The town of Armidale suffers from temperature inversion layers which sometimes trap high levels of wood smoke in the atmosphere. 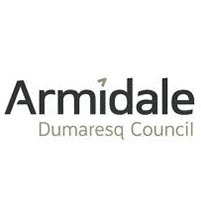 It is estimated that about one-third of all Armidale housholds use wood for heating, and, in winter,daily levels of PM2.5 regularly exceed National Health Advisory limits- frequently by as much as three times the limit.